Permit me to say something nice about Monteith’s. See that label over there on the left? That label starts me reminiscing about the time I discovered Monteith’s and when it was good. That was the label it was sporting when I found it while on a trip to New Zealand. 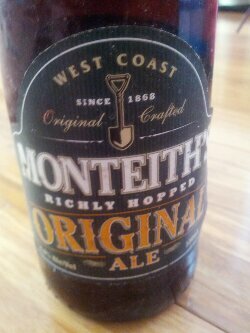 And that was the label it was sporting when I would get excited about finding it in a bottle shop in Australia – for this was back in the day when Monteith’s was exceedingly hard to get. But since then, they’ve gone and changed the label. At the same time the beer stopped tasting as good. Are the two things more than just coincidence? Hmmm. Now, I’m not going to say anything nice about this bottle of Monteith’s Original Ale. But that’s not the fault of Monteith’s – I’m not going to hold them to blame for this bottle tasting crap. That’s just what’s likely to happen when you’re drinking a beer with a best-before date of August 2003. I’d actually be immensely surprised if it tasted good after that amount of time. What it does taste like is tea. Cold tea. Cold tea with honey. And some rust too. Cold, rusty tea with honey. Before you ask, I didn’t get any of that ‘‘subtle berry aroma’’ promised on the back label. Again, it’s not Monteith’s fault the beer smells like rusty tea too. I couldn’t even finish this beer, having to pour it down the drain. And, as much as I mock Monteith’s, I’ve always finished their beers before.